The apartment is filled with a sweet aroma of vanilla and roasted mushrooms. The smell and coziness welcomes us into the bustling Berlin, Wedding kitchen. Yannic and Susann, both photographers and food bloggers, invited us to try a homemade pumpkin tart in their lovely home. They started their food blog Kraut Kopf a few months ago. Their focus has been on vegetarian recipes and from time-to-time they post vegan dishes. Whilst grinding the buckwheat, Yannic tells us that they plan to explore the Paleo cusine in 2014. What they are making for us today is similar to the Paleo diet, in that it’s a cusine that doesn’t use any industrially prepared ingredients. And that’s how we are fortunate enough to enjoy a ‘stone-age-like’ pumpkin tart in the 21st century. Yannic and Susann hardly ever cook using recipes, they prefer to go by taste. Yannic especially has a refined taste. He can discern the individual components of every plate and likes to experiment with them by creating his own dishes. Today, he and Susann are showing us their new recipe, the Pumpkin Tart. Food plays an important role in Susann’s and Yannic’s life, regardless of whether it’s cooking at home or going out to eat. Both of them place a high importance on good quality food, knowing how to prepare it, and knowing exactly what’s in it. This is also why they make a lot of ingredients themselves, for example the flour used in the pumpkin tart today. Once you are done, knead the flour together with the remaining pastry ingredients into a smooth dough. Wrap the dough in cling film and let it rest in the fridge for 30 minutes. Then roll it out. Grind the buckwheat, millet and almonds into a fine flour. Knead the flour together with the remaining pastry ingredients into a smooth dough. Wrap the dough in cling film and let it rest in the fridge for 30 minutes. Then roll it out. Divide the dough in two parts and shape it into the tart tins. Make sure that there are no holes in the dough. Prick the dough with a fork and then blind-bake it using peas or lentils at 180°C for 10 minutes. Remove the peas/lentils and continue to bake for a further 15 minutes. Peel the beets and carrots. Cut them into fours, and wrap them loosely in aluminium foil. Sprinkle them with sea salt and pepper, then drizzle with olive oil. 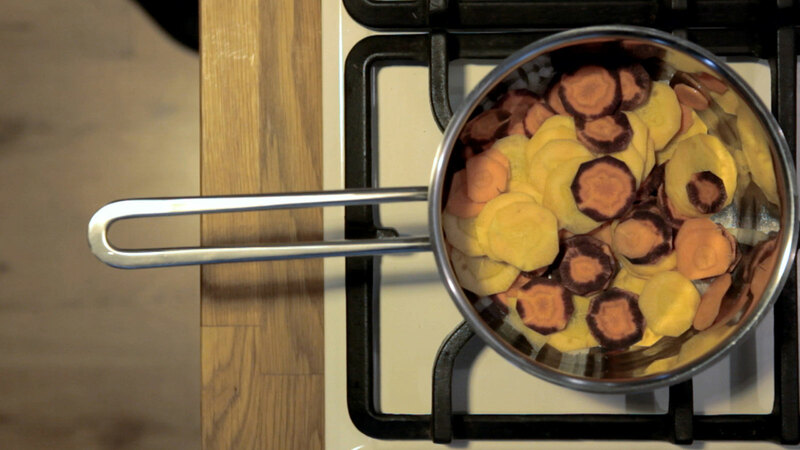 Cook the beets and carrots in the aluminium pouches at 160°C for 30-40 minutes. Before closing the aluminium pouches, add some star anise to the carrots, and cumin and cinnamon flower to the beets. Close the aluminium pouches carefully so that no juice spills. 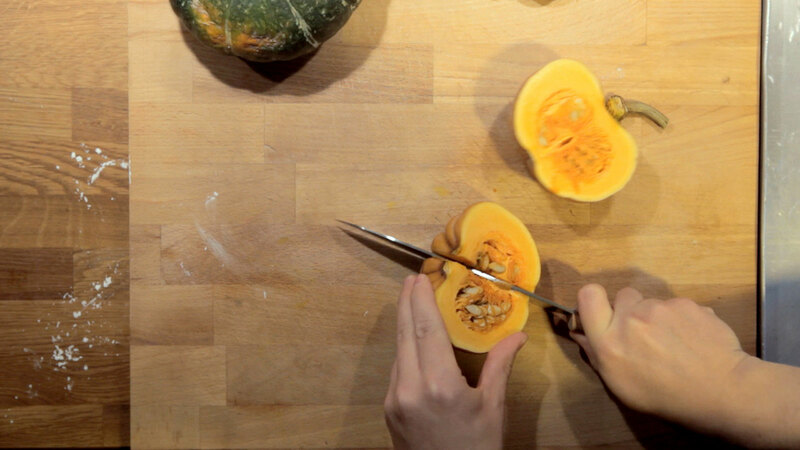 Cut the pumpkin in half, then into quarters and remove the seeds with a spoon. Continue by cutting the quarters into thin slices. Place the pumpkin slices onto an oiled baking tray. Chop the shallots and garlic and throw them in along with the vanilla pulp, salt and pepper. Cook the pumpkin at 160°C for 30-40 minutes until soft. To make sure it’s cooked, test it with a fork. Spoon out the pumpkin pulp and purée with the garlic and shallots until it reaches a smooth texture. Add the lemon zest and grated nutmeg and season with salt and pepper. Peel the carrots, cut them into slices and fry them lightly in olive oil. Clean the mushrooms, cut the shallots into small dices and gently fry them in olive oil. Season everything with salt and pepper. Now the tart needs to be filled. First add the pumpkin. Next, the mushrooms and carrots. Finish by putting the tart into the oven for 2-5 minutes. 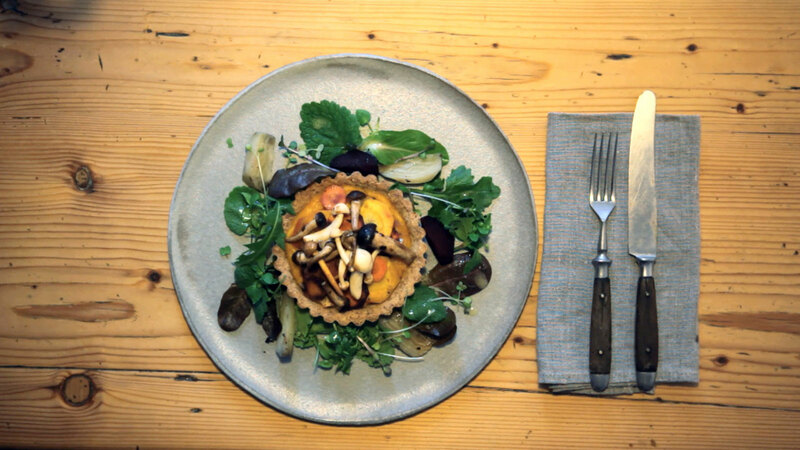 Serve the tart on a bed of wild herbs with the root vegetables on the side. Compliment the salad with a vinaigrette of lemon juice, olive oil, mustard, honey, salt and pepper. Discover more FvF Cooks stories and delicious recipes.